Here at long last is the Exclusive Director's Cut 25th Anniversary Edition of the classic motion picture about good food gone bad! When yet another secret government project goes awry, nature runs amuck! 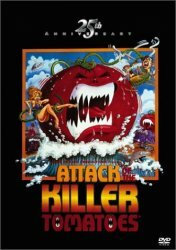 This time, garden variety tomatoes take on mammoth proportions and crabby dispositions and begin attacking innocent people! Includes in-your-face humor, hilarious fashions, long-lost footage, and brand-new, never-before-seen stuff, like an exclusive interview with a confessed killer tomato. You'll never look at a salad bar the same way again!